VATICAN CITY (CNS) — Vatican efforts to honor those who suffer and die for their faith while trying to negotiate with oppressive regimes to expand religious freedom have been fraught with criticism and real pain for more than 50 years. For example, whether Vatican diplomatic efforts during the Cold War helped ensure the survival of the Catholic Church behind the Iron Curtain or amounted to appeasing evil is still a subject of scholarly debate. But, unfortunately, the topic is not just a matter of history. A similar tension is being played out in China, where the Vatican is engaged in dialogue with the communist government in an attempt to move, however slowly, toward a situation in which all the Catholic bishops would be in full communion with Rome and all Catholics would recognize each other as members of the same church. But some people who have given up their freedom to remain faithful to the pope and some who have observed the resulting suffering see the Vatican’s dialogue with the Chinese government as a betrayal. 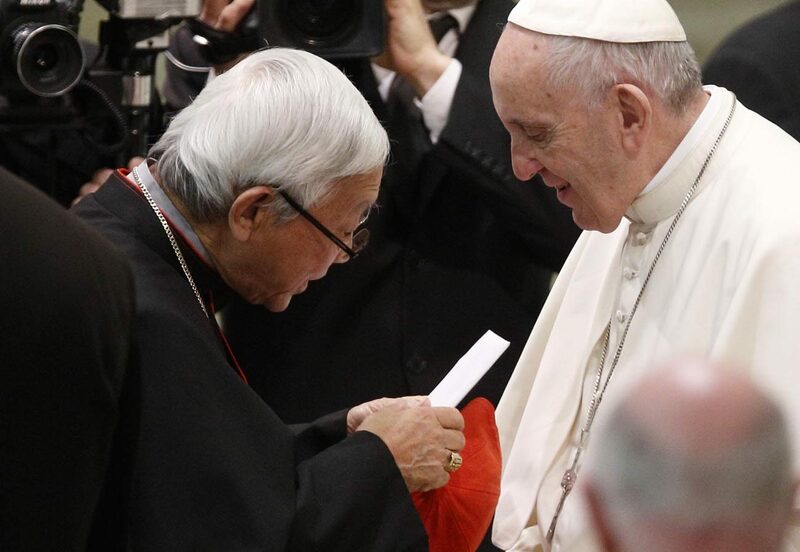 One of the loudest critics of the Vatican’s current engagement with the Chinese government is Cardinal Joseph Zen Ze-kiun, retired archbishop of Hong Kong. While Cardinal Zen acknowledged that some Catholics who have cooperated with the government-approved Chinese Catholic Patriotic Association did so “not by their own free will, but under heavy pressure,” he also said others are “willing renegades” who, in effect, are in schism. For decades, the communist government has insisted on naming bishops for Chinese dioceses; for the Catholic Church, that is the prerogative of the pope, since unity with the pope is the guarantee of unity with the church. But the Vatican’s current policy not only involves dialogue with the Chinese government to find agreement on the appointment of bishops and pry open even some tiny space for religious freedom, it also is focused on healing relations among Chinese Catholics. The importance of uniting Chinese Catholics was explained by now-retired Pope Benedict XVI in his 2007 letter to Catholics in China. It is in building a “communion of love that the church appears as ‘sacrament,’ as the ‘sign and instrument of intimate union with God and of the unity of the human race,'” Pope Benedict wrote. “Avoiding judgments and mutual condemnations” is the only way to promote unity in a situation where individuals, particularly bishops, must decide the extent to which they can cooperate with the government for the good of their communities. Criticism of the Vatican’s Cold War outreach to Soviet-bloc nations was focused on Cardinal Agostino Casaroli, seen as the project’s chief architect. A full-time Vatican diplomat for decades, he served as Vatican secretary of state from 1979 to 1990. In a similar way, Cardinal Pietro Parolin, the current secretary of state, is at the center of discussion over the current attempt to dialogue with the Chinese government. In his Jan. 29 Facebook post, Cardinal Zen seemed to imply that Pope Francis was not fully informed of Cardinal Parolin’s activities and approach. The Vatican press office swiftly issued a denial. Cardinal Parolin himself responded in an interview published Jan. 31 with the Italian newspaper La Stampa and its Vatican Insider website. But in China, he said, the unity of the church also is threatened by judgments Chinese Catholics make about each other based on the level of their acceptance of government involvement in the life of the community.